The above Royal Mail Europa 1990 stamps were issued on 06 March 1990 by Royal Mail and feature the following stamp designs: 20p Alexandra Palace; 20p Glasgow School of Art; 29p Philatelic Bureau; 37p Templeton Carpet Factory. The 75th Anniversary No.8 Squadron first day cover with the BFPS - Forces, No. 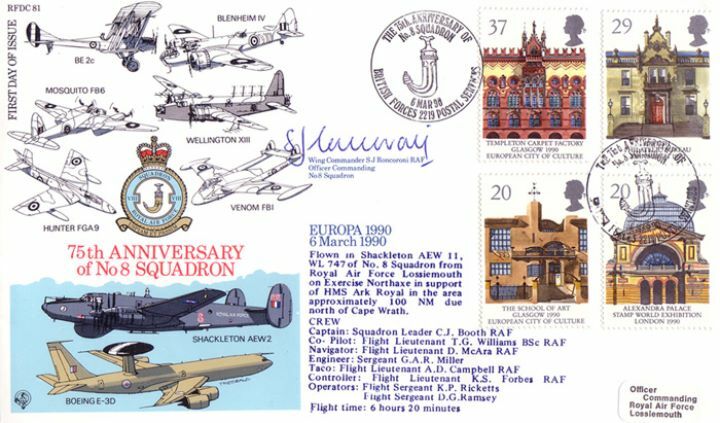 8 Squadron, Special Handstamp postmark has been produced by Forces and features these stamps which can make a very collectible and lovely gift.